Här har vi en ny 4:2 HDMI Matris från Cyp/// som har stöd för 4K upplösning samt HDMI 2.0 och HDCP 2.2. OR-42-4K22 stödjer de senaste funktionerna i HDMI 2.0 specifikationen så som 4K UHD upplösning ( [email protected] - YUV4:4:4 ), HDR ( High Dynamic Range) , 'Deep Color' och HD Ljud. 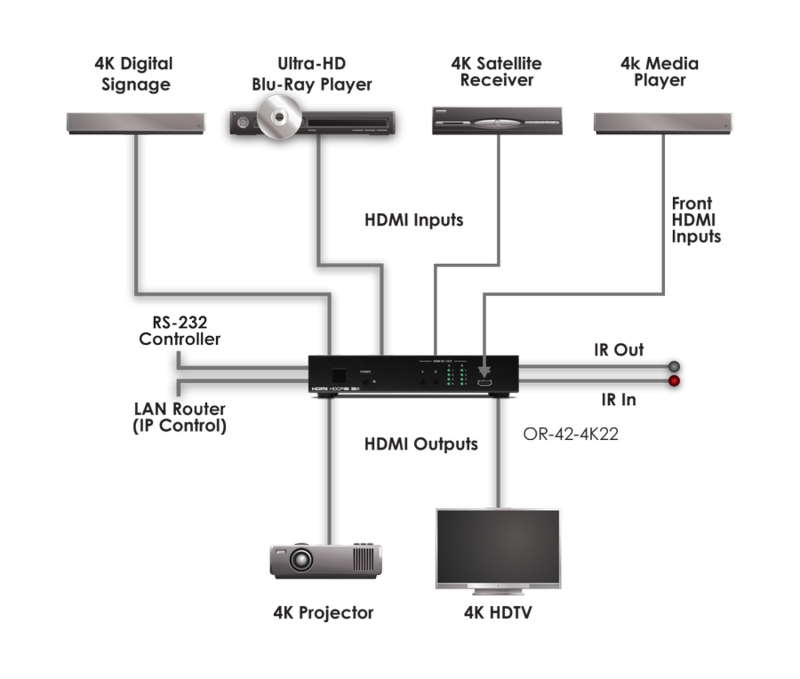 This 4x2 HDMI Matrix Switcher is designed to enable the user to switch between any of the four connected HDMI sources to send video and audio to either of the two connected HDMI displays. This matrix switcher fully supports 4K resolutions and is HDMI2.0 and HDCP 2.2 compliant, ensuring maximum compatibility with the latest 4K UHD sources and displays. The unit supports all the latest features of the HDMI2.0 specification such as 4K UHD resolutions ([email protected] - YUV4:4:4),HDR (High Dynamic Range), 'Deep Color', and High Definition audio. Control is via manual selection buttons, IR, RS-232, Telnet or Web GUI.